Learn how to play the fascinating, awe-inspiring taiko! Join one of our 90-minute introductory workshops or get the family together to enjoy a 60-minute Family Play Taiko workshop. 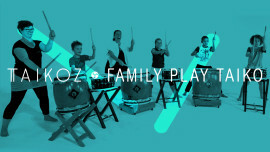 Play Taiko will leave you with a unique group experience that will energise, stimulate and excite. Taiko playing requires great energy and teamwork, as well as total integration of one’s mind, body and spirit; the rhythm of the taiko pulsates through your body – its expression is primal and earthy. Taiko playing is also great exercise. It is a musical activity that is challenging and fun, and offers wonderful benefits like reducing stress, aiding relaxation and inviting personal expression. The Taikoz members and associates who lead our workshops are all highly trained performers and teachers. Prior musical training is not a requirement.